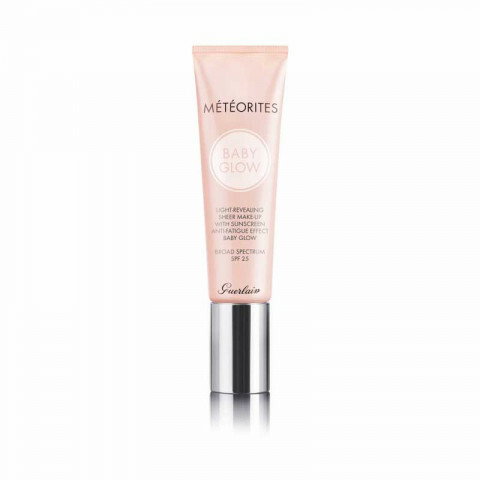 With Météorites Baby Glow, for the first time, light becomes liquid... subtle, silky, impalpable. With a unique alchemy that combines technology with a touch of magic, this liquid light glides onto the skin as a luminous, perfecting veil that erases signs of fatigue and reveals the youth and natural glow of the complexion. The skin looks rested, smooth and replenished - as beautiful and fresh as a baby's skin. Like an infusion of moisture, the ethereal and delightfully aqueous texture of Météorites Baby Glow makes it glide effortlessly onto the skin, suffusing it with a long-lasting sensation of comfort. With this hydrating burst of freshness, the skin relaxes and appears refreshed, invigorated, plump and radiant. This is quite luxious and I receive compliments whenever I wear it. For some reason, a lot of Guerlain's base products lean really pink -- to the point it oxidizes leaving my neck and face two different shades as the day progresses. This works better as a primer than a tinted moisturizer, in my opinion.